Diving at dive site City of Washington made famous for rescuing passengers from the USS Maine during the Spanish American war. The City of Washington lies west of Elbow Reef, just five hundred yards northeast of its lighthouse between buoys E9 and E10. It was a 320 foot long, 38 foot wide two masted schooner supplied with a huge steam engine. Originally built in Pennsylvania in 1877 she could accommodate over four hundred passengers and crewmembers. Her history as a steamship is spectacular starting as a three deck passenger and cargo deliverance ship between New York, Mexico, Panama and Cuba. In 1898 she was one of the ships that assisted in rescuing passengers from the USS Maine, which exploded while docked in the Havana harbour. Relations between Spain and America about the rebellion in Cuba were bad already but this was one of the events that igniting the American Spanish war. During the war she transported troops until 1908 when she retired and was sold to be used as a coal-barge. She sank on July 10, 1917 when she and another ship the Seneca were towed by the Edgar F. Luckenbach #4 and all ran aground Elbow Reef. The Seneca and Luckenbach were salvaged quite quickly but the City of Washington broke in two and was without salvaging anymore. Much of the wreck has disintegrated but nevertheless she is one of the most intact of all the historic wrecks at Elbow Reef. Its main hull and keel framework are still visible but deterioration of the many years under water has created some huge gaps. You will be disappointed if you are hoping for some excellent wreck penetration as the ship is fully open. On its highly damaged bow section you can find large steel hulled plates which are twisted inwards. Reports state that these are the holes that were created when it collided with Elbow Reef. Other well recognizable features you should definitely visit are its deck ladder, propeller shaft log, top rail, bilge pump assembly and its port side chock, all still quite intact. Because of its shallow depth, low current and high visibility she has become an excellent snorkelling location and night dive site. Further more its proximate reef nearby provides for an excellent two tank dive doing one on the wreck and one on the reef. Green moray eels live in the cracks and crevices, black groupers are spotted along its bow and nurse sharks are regularly encountered all used to divers because they are being handfed for many years. They have known to grow bolder and more aggressive with stories about barracudas biting in fingers so be careful not to be mistaken with a quick snack. Even at more than one hundred foot away from the wreck you will still find all kinds of smaller pieces inhabited with sergeant majors, yellowtail snapper and flame oysters. 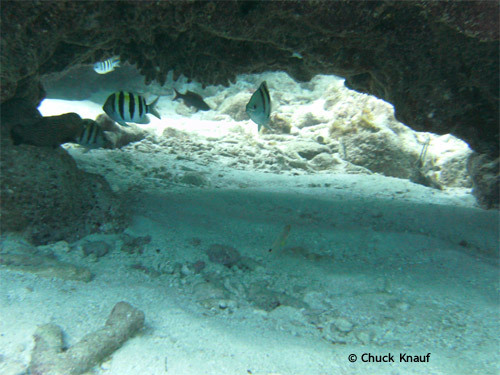 It is probably one of the best dive sites in Key Largo suitable for all level of divers.